Over the course of a career, there can be periods of time when women struggle to overcome certain roadblocks on the road to their success. 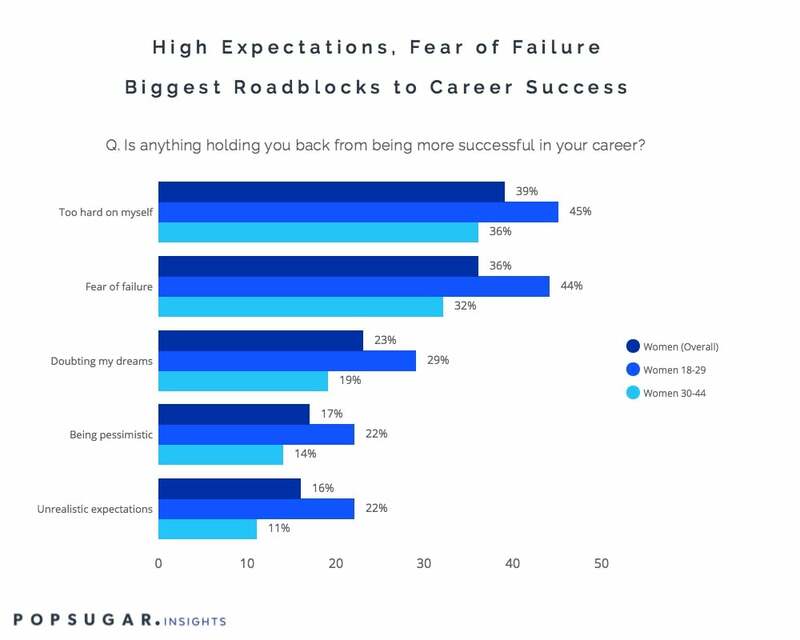 As part of the POPSUGAR Insights 2016 Career Report, we surveyed over 2,000 women between the ages of 18 and 49 to ask them what things might be holding them back from being more successful in their careers and what they consider to be their greatest strengths and challenges or obstacles when it comes to their career development and achievement of their goals. Overall, the results show that women are setting high goals, creating unrealistic expectations, and judging themselves too harshly. Nearly four in 10 women say that they are too hard on themselves (39%), with women under the age of 30 15% more likely to admit this than women between the ages of 30 and 44. Fear of failure ranked second for women overall (36%), again with women under the age of 30 22% more likely to cite this than women between 30 and 44. Over one in five women said that doubting their dreams is an obstacle to their career success, and again women under age 30 were 26% more likely to consider this a significant obstacle. Being pessimistic when it comes to their career ranked fourth overall, with women under 30 29% more likely to consider this a challenge. Finally, while unrealistic expectations ranked fifth overall for female respondents, women under the age of 30 were 38% more likely to cite this as a current obstacle, proving that younger women who are just beginning to take their first significant career steps need all the help they can get to find solid footing and have a realistic set of expectations about their goals and ambitions, while women between the ages of 30 and 44 are more likely to be too hard on themselves and need help level-setting their expectations of career success. Part of the disconnect seen in the above data could stem from the conflicted views that women have about their career strengths and weaknesses. We asked women to tell us what they consider themselves to be best at when it comes to their career and what they consider to be their biggest career obstacle or challenge, and the results showcased the reality that career strengths, similar to financial assets, are unique to the individual and there isn't necessarily a "one size fits all" strategy that can address the challenges for every individual. We learned that overall, things that some women consider to be their strengths are what other women consider to be weaknesses, such as communication. Specific strengths that women mentioned included organization, management, and creativity. Work-related obstacles included confidence and managing stress. The good news is that these findings highlight an opportunity for brands to become a woman's career champion, help her overcome her obstacles, improve on her strengths, and discover the career path that is right for her. Women under 30 are at a critical stage in their professional lives, and the decisions they make can have profound implications on their careers, their financial futures, and their overall happiness. The results of the survey prove that women aspire to do more and be more when it comes to their careers, but some lack the confidence and expertise necessary to succeed. By offering relevant content that speaks to their needs and helps their career aspirations move closer to becoming a reality, brands hold a unique power to help shape the future for a generation of women who aspire to be leaders.